All new registrations for students for the 2015-2016 school year will take start being accepted as of November 26, 2014. LaurenHill Academy also registers new students throughout the school year, however, acceptance depends on classroom availability. All applications for the Certificate of Eligibility for Secondary students must be done at the English Montreal School Board Administration Building. 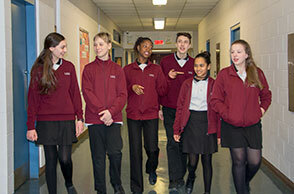 LaurenHill Academy welcomes students and their families to Canada from all over the world. Families living Quebec on a temporary basis (work or school visa) can be eligible to send their children to an English public school.